The first frost was on its way and I called a farmer friend Rebekah Rice from 9Mile Farm to check if she could use my help with cooking in exchange for some greens. I told her I will work for food! 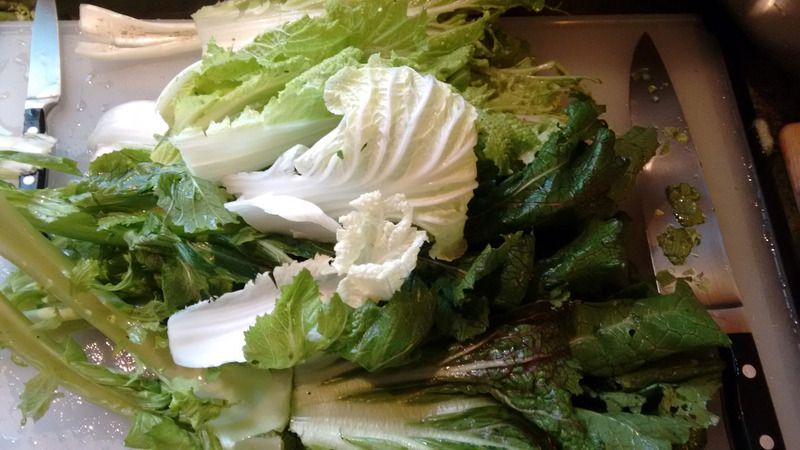 I spent a few hours there and brought home bags of bok choi, napa cabbage, and mustard leaves and bonus: peppers. 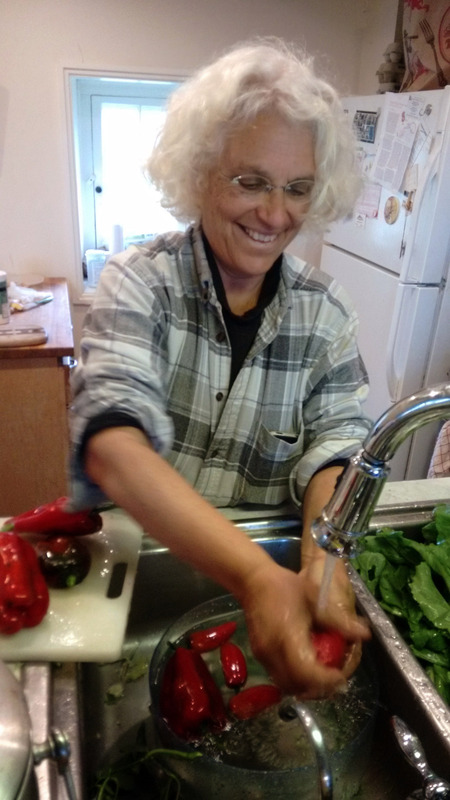 At Rebekah’s farm, those leaves were going to feed her chickens, so I appreciate very much her sharing with us and I can’t wait for her to taste some of these ferments. 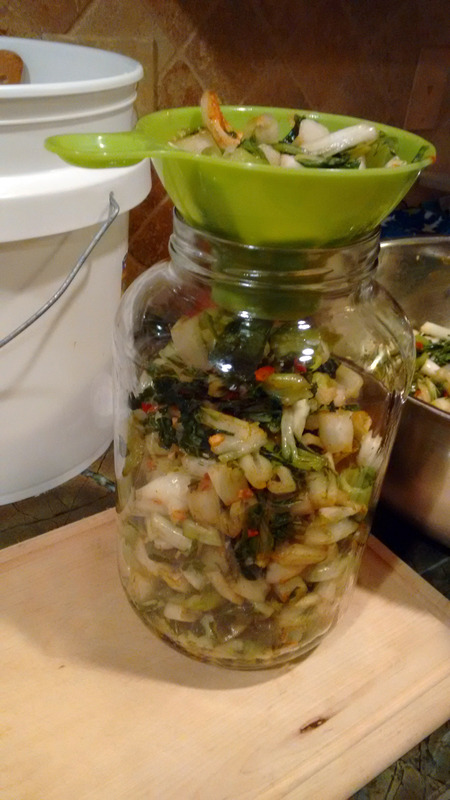 With what I had at hand, I could make kimchi, or simple sea salt vegetable ferment. At first look, why mess with those outer leaves? 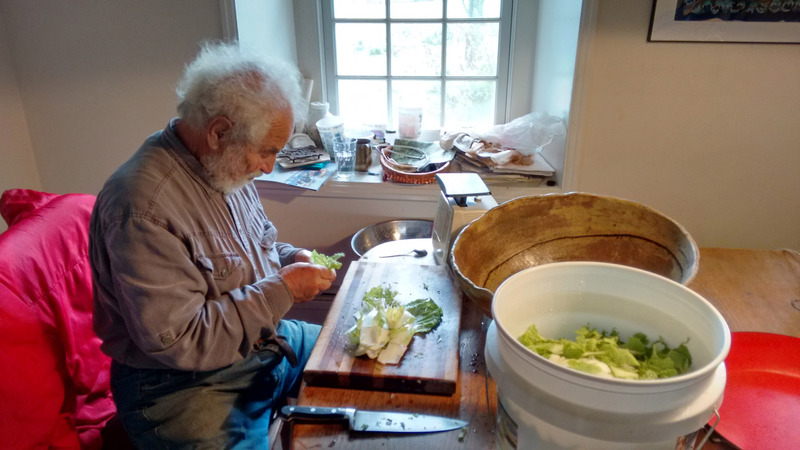 Food waste is something that is always on my mind, probably because of the gleaning I did with my family, watching my parents save everything, trying to make ends meet. It was the way of life. And it is what I want for myself and my family now. We are blessed with safe and plentiful food our our table, but it is always on my mind that “40% of good food is thrown away in America while millions are food insecure.” The state of Massachusetts has a commercial food waste ban in place that started last month – “no food waste hits the landfill”, and that is exciting news. Maybe we will see something happening in the residential waste level soon. I am for using the extra food we produce and that is safe to eat. When I see foods destined to be discarded, I see the potential of transformation into something delicious and nutritious. Not all of us will have the time to process cull, some of us may not know how, but there are things we all can do at home, sometimes as simple as eating our leftovers or labeling our leftovers, freezing them and eating later. I am more than happy to work the entire weekend sorting, cutting and picking snails off organic leaves. The reward? My mouth waters just thinking about those jars of kimchi in my fridge now. So I will pause here to go eat a bowl, but first I stared proudly of what has become of those precious greens. The next best thing to eating them, is to share them. I posted this photo of my jars on facebook asking if anyone would want to trade food with me. 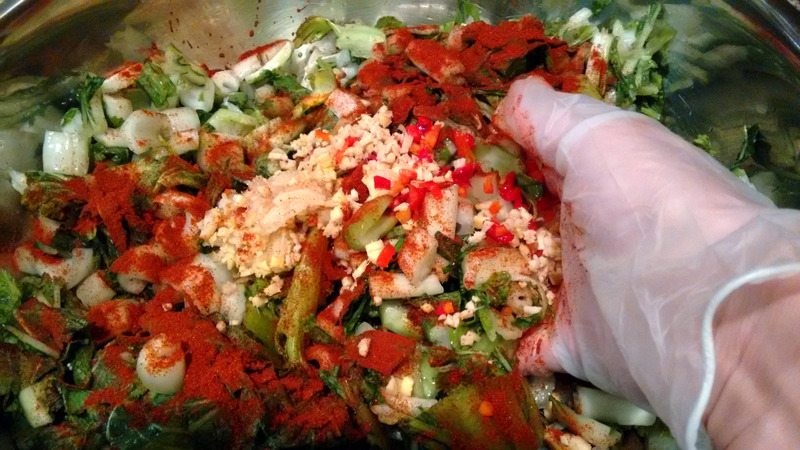 I am trading kimchi with friends for jam, hot peppers, eggs, dried apples and pancake mix! I also got requests for the recipe, so here it is. 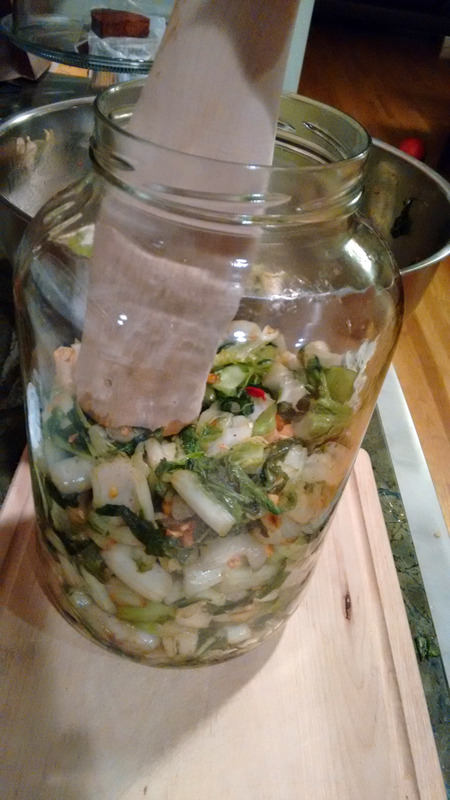 My kimchi inspired ferment recipe is a combination of information from books (wild fermentation), online recipes ( fermentation on wheels) , friends recipes, practice and lots of tasting. This recipe is fish free and uses few hot peppers, but you could add both. 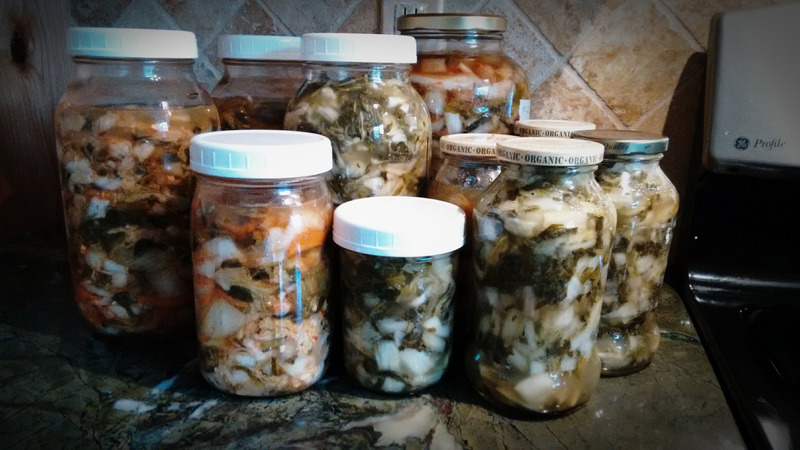 I love to be able to incorporate the fermented veggies to recipes or serve as a side dish for my family. I started a batch at Rebekah’s kitchen a few weeks back, working with her and her father, Michael, good fun to cook together. 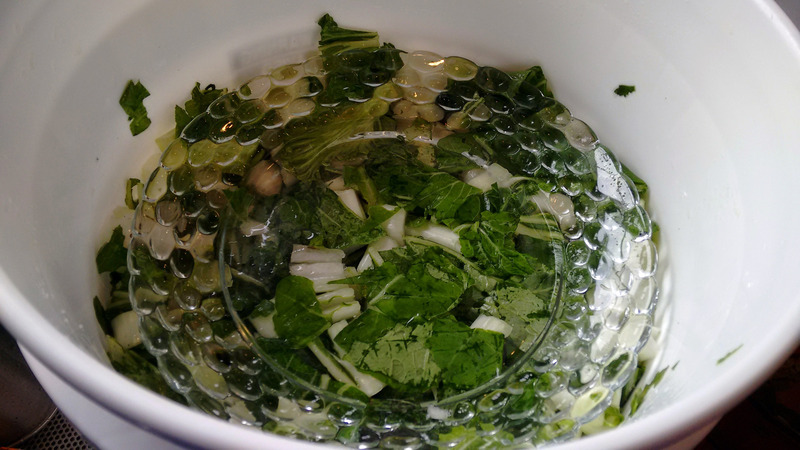 Brine: 4 cups of water and 4 tablespoons of salt, double if necessary to cover veggies overnight or 6hrs or so. I use a plate to weight it down and keep the veggies covered with light fabric. By the morning there will be plenty of liquid. Strain veggies and taste, if too salty, rinse, if not enough salt, add more. 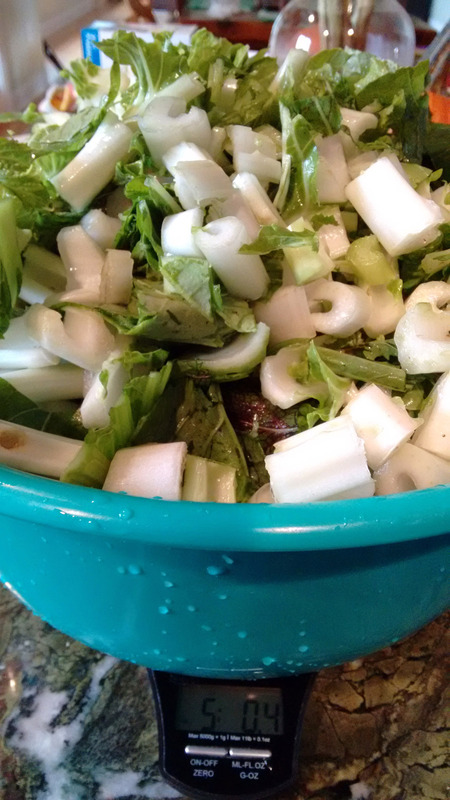 Save the brine in the fridge if you need to keep the veggies under liquid. 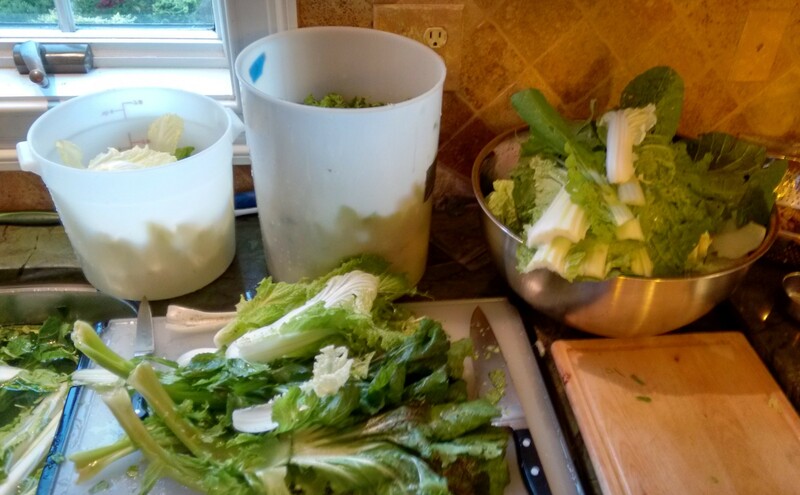 Pack into jars, make sure vegetables are covered with brine, use the salty water if needed here and a larger leaf as the last layer to keep veggies from floating to the top. Weight it down. I use covered glass jars filled with water, or a stone. Date the jars. Ferment 7 to 10 days, watching if the brine starts to dry, press it down and add more brine. Cover with light fabric to keep out dust and flies. Set on a tray. Keep fermenting for a month if desired. When it taste good to you, take the weight off, remove the top leaf, cover and refrigerate for 6 month to 1 year. I’m going to try to make this soon. Wish me luck Ellie! Yes! You can totally do it and let me know how it turns out Susan. So exciting. In time you will adjsut your own style and preferences. I can’t wait to try making this. Growing up in Hawaii as a teenager I was able to taste the most delicious kimchee regularly. They eat it with breakfast, lunch and dinner!!! Wish me luck. You will rock it Susan! This is so great, Ellie. A fantastic read! I’m definitely trying out your recipe. Thank you for stopping by and your kind words Deanna. 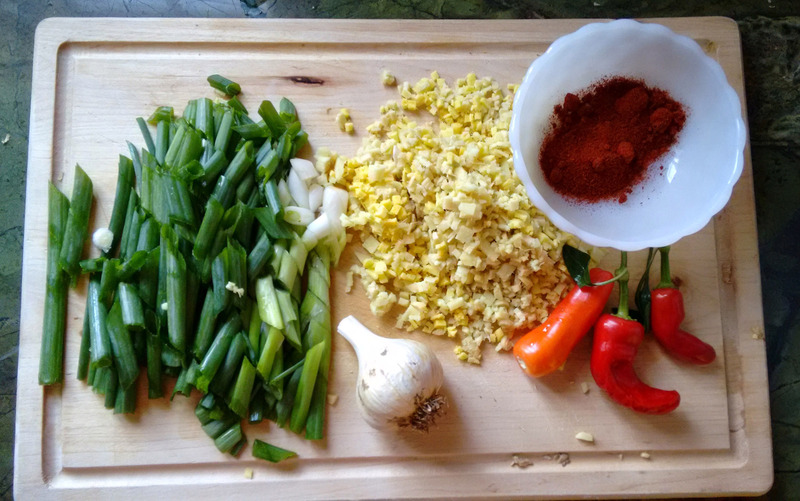 It takes a little time, but not much more than cooking any other meal. So wroth it and delicious. It is what I am having for lunch with some rice in a few minutes! Mark will come by tomorrow. 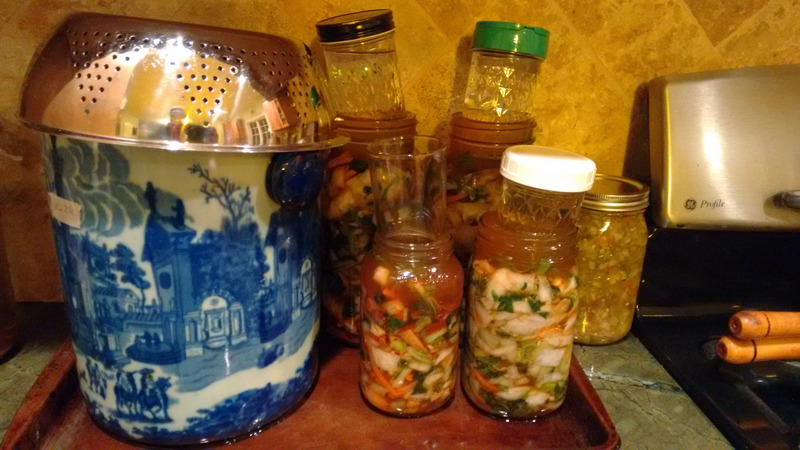 My son and I have a kimchee making date this weekend.